Recent press articles warn about the possibility of the North Koreans launching an electromagnetic pulse (EMP) attack on the United States, and there are even suggestions that the recent missile test failures may represent a thinly veiled EMP threat. However, such an attack from North Korea is unlikely, as it would require the North to have much larger nuclear weapons and the missile capability to deliver them. 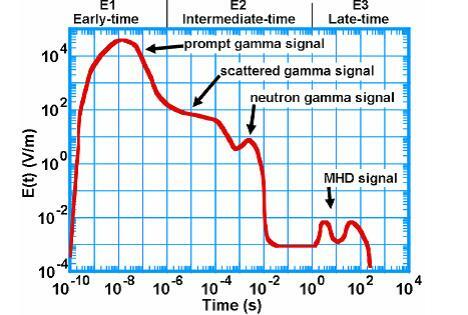 When a nuclear explosion occurs at high altitude, the EMP signal it produces will cover the wide geographic region within the line of sight of the detonation. This broad band, high amplitude EMP, when coupled into sensitive electronics, has the capability to produce widespread and long lasting disruption and damage to the critical infrastructures that underpin the fabric of U.S. society. The effects of the pulse can be transferred directly to sensitive devices or as an electrical surge over power lines. The generic diagram below shows an EMP to consist of three phases (E1, E2 and E3) occurring over vastly different time scales. Of these, E1 is the most damaging. The others are 100 times (at minimum) less damaging than the first. Figure 1. The three phases of an EMP threat. The E1 component of an EMP is a very brief but powerful electromagnetic field that can induce very high voltages in electrical conductors. Damage occurs by causing voltage limits in equipment to be exceeded and happens so fast that ordinary surge protectors cannot effectively protect computers and communications equipment. However, special transient protectors fast enough to suppress this part of an EMP exist and there has been significant progress in hardening critical systems against EMP. The E1 component is produced when gamma radiation during the first 10 nanoseconds (1 nanosecond = 1 billionth of a second) from the nuclear detonation rips electrons out of the atoms in the atmosphere. The electrons travel at relativistic speeds (more than 90 percent of the speed of light) to illuminate the area beneath the blast. The Earth’s magnetic field acts on these electrons to change the direction of electron flow to a right angle to the geomagnetic field that may cause downward electron flow to produce a very large, but quick, electromagnetic pulse over the affected area. The E2 component is generated by scattered gamma rays and gamma emissions produced by neutron collisions from the explosion. This component lasts from about one microsecond to one second after the beginning of the electromagnetic pulse and is similar to the electromagnetic pulse produced by lightning. Because of the similarities to lightning-caused pulses and the widespread use of lightning protection technology, the E2 pulse is generally considered to be the easiest to protect against. The E3 component of the pulse is a slow pulse, lasting tens to hundreds of seconds. It results from the nuclear detonation distorting the Earth’s magnetic field, followed by its restoration. This component is quite similar to a geomagnetic storm caused by a very severe solar flare. Like a geomagnetic storm, it can induce currents in long electrical conductors, with the potential to damage power line components. The electric field damage threshold is 15,000 volts/meter or higher in the E1 component. Plugging in the numbers and presuming these assumptions are appropriate, the rule of thumb is surprisingly simple: D = Y, where D is the maximum damage distance expressed in kilometers and Y is the yield of the blast in kilotons. So, a 20 KT bomb detonated at optimum height would have a maximum EMP damage distance of 20 km; a 1 MT (1,000 KT) bomb would damage out to 1,000 km. The largest North Korean test to date has been estimated to be about 20 KT. 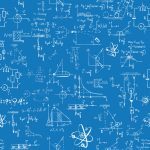 Considering the physics behind EMP and the status of North Korea’s nuclear program to date, doomsday headlines in the press regarding the North’s potential EMP threat are grossly overstated. North Korea’s nuclear tests have not yet demonstrated sufficient yield to cause damage to large areas through EMP. Moreover, with only a limited arsenal, it would not make sense for the North Koreans to conduct nuclear tests simply to develop EMP weapons. John Foster, et al., Report of the Commission to Assess the Threat to the United States from Electromagnetic Pulse (EMP) Attack—Critical National Infrastructures, April 2008. Edward Savage, James Gilbert, William Radasky. The Early-Time (E1) High-Altitude Electromagnetic Pulse (HEMP) and Its Impact on the U.S. Power Grid, Meta-R-320, Prepared for Oak Ridge National Lab., Jan 2010. In the early 1950s, above ground nuclear tests of a size similar to what the North Koreans have demonstrated were conducted at the Nevada Test Site just 65 miles from Las Vegas. There were no reports of power outages. The casinos continued to operate. Nuclear fallout was the bigger issue.